I love using math interactive notebooks! They have been a part of my classroom routine since I moved to Texas. Regardless of the grades I’ve taught, I have found success using them with all of my students in kindergarten, first, second, third, and fourth grades. After all, most of my teaching experience could be summed up by those grade levels! While interactive notebooks can be used in any subject, my favorite subject to use them in is math! Take a look at five of the reasons why you need to check out my math interactive notebooks. 1. Math Interactive Notebooks are…well, interactive! Interactive notebooks allow students to get hands-on practice or show mastery of a specific concept or skill. Students practice or show their understanding of a topic by “interacting” with it within their notebook. Interactive notebooks contain folds and flaps, or graphic organizers, that are created to “move” with the students. Students cut, fold, crease, and glue tabs into their notebooks. These specially-shaped pieces become a medium for the students. Students draw, write, generate, create, use, location, model, describe, solve, represent, determine, and a plethora of other actions, using their folds and flaps within the interactive notebooks. Students are engaged and excited as they learn using their notebooks! These notebooks are just not for days when students are adding to it. My students use their notebooks daily as a scaffold and support for their new learning, new and old. I used to get frustrated when my students were constantly asking me how to special something or how exact of a process. Can you relate? Interactive notebooks work as an anchor for student learning too. Just like a chart on the wall, students access the information that is kept directly in their notebook that they can use as they need. Students interact with the prior information found in their notebooks throughout their work time, math unit, and school year. I recently took on a large scale project and created all of the templates you need to use math interactive notebooks in your kindergarten, first, second, third, or fourth grade classroom! With my experience as a teacher of all of these grade levels (not all at the same time,) I have delved into the standards, taught, and lead my students to mastery and YOU can too! 2. Math Interactive Notebooks are a lot of work, but not anymore! When I first started using interactive notebooks, I spent hours on the computer studying the Texas standards, or TEKS. I would write down a list of the vocabulary words my students needed to know. In addition, I looked specifically at what my students needed to know, the content, to master the concept (e.g., how to generate a number, how to use place value, etc.) My weekends and week nights were consumed with planning this things out! You know the feeling! You've been there and done that too! With my math interactive notebooks, there is NO homework for the teacher! Simply print the file! There are teacher pages designed with you in mind. These informational pages contain photographs of the actual folds and flaps and activities in use. This gives you a visual image of how the notebook is to look with the fold and flap in it! With my interactive notebook, there is NO guesswork! For each fold and flap, there is also an answer key. The answer keys show the finished products as they should appear in the students' notebook. No more guessing what should go underneath the flaps AND no more searching on the computer for definitions or specifics! Maybe this section's title should read: Math Interactive Notebook are simple! 3. Math Interactive Notebooks guide new Texas teachers and teachers new to the grade level. 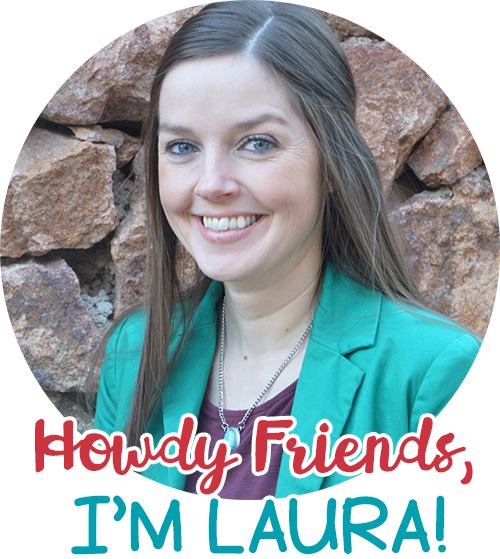 I started my teaching career while I was living in my home state of New Mexico. Yep, the Land of Enchantment! When I moved to Texas, it was a big task to learn the Texas standards, or TEKS. I am thankful for that experience now, but at the time, I felt like I was on a sinking ship. I was always drowning in information to look up and research. When you download a math interactive notebook, you will see where you are going in your math unit. You will instantly know the main vocabulary words that your students need to master and the content you will be teaching. In a way, the notebook is a map for your journey through a unit! 4. Math Interactive Notebooks keep you and your students organized. Each math interactive notebook comes with one tab divider page. Not only does this page serve as a place marker in the notebook, it also gives specific information for the topic of the unit. In this first grade example of the tab divider page, students have a visual that helps guide them through their learning. Take a quick glance! Can you see what the students will be learning? Along the top of the tab divider page, there is a visual organizer which shows the students the problem solving model. I attached an image to each step in the process to give the students additional support, which is important for younger students. This is a great helper for you as the teacher to have a one-stop show for some of the bigger ideas in the unit. You may also be interested in printing a copy and sending it home for parents too! 5. Math Interactive Notebooks can be differentiated for ALL students. Interactive notebooks are inclusive. All students can thrive using their notebooks. There are some simple things that can be done with modify the activities to assist students who need additional support. 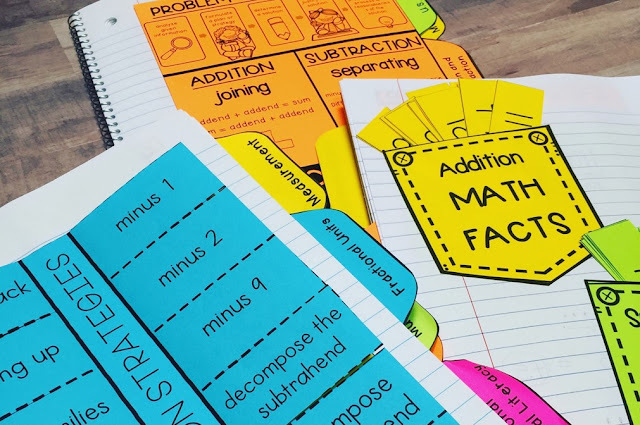 You can add math manipulatives to add of the activities to give students additional hands-on practice and support as they are solving problems in their notebooks. Some folds and flaps are meant to be written under, but I included strips that can be glued underneath the flaps too. These strips allow the freedom to differentiate in the classroom. I felt strongly about the flexibility to differentiate the use of interactive notebooks. This is especially true with the vocabulary folds and flaps! There are a lot of words included. Most units contain between six to twelve words which means there are a lot of definitions! Last year, I taught an average sized group, 22 students. In my classroom, I had two students who were being seen by an occupational therapist for difficultly with cutting, pasting, and writing. When we used our interactive notebooks, the students' team members (grouped team created with their desks) would help cut and paste. I would write in all of the phrases or sentences that was just too overwhelming for the students. As I was designing these notebook units, it was imperative that I reduce the amount of assistance needed for complete the different activities. Of course, interactive notebooks need to be monitored, as with any assignment in the classroom. I wanted the students to have more independence and feel successful putting their notebook together. Whether you have used math interactive notebooks for years in your classroom and are looking for an easier way...or someone new to a grade level looking for hands-on, TEKS-aligned math activities, I am positive that you will benefit from my math interactive notebooks. I have taken the guesswork and homework out of planning the notebook unit components; provided support for all teachers, especially new teachers and those new to the grade level; placed an emphasis on organization; and made it easier to differentiate notebook activities. I hope this post inspire you to try math interactive notebooks in your classroom, and if you want to check out my notebooks, they're in my TpT shop. What is your favorite part of math interactive notebooks? What a great post. Your products are amazing! Love the interactive sheets, so do my students!! !